When cutting picture frames or other metered joints, I want to be certain that the mitre gauge on my table saw is set to precisely 45°. So I use a framing square to check its accuracy before cutting. 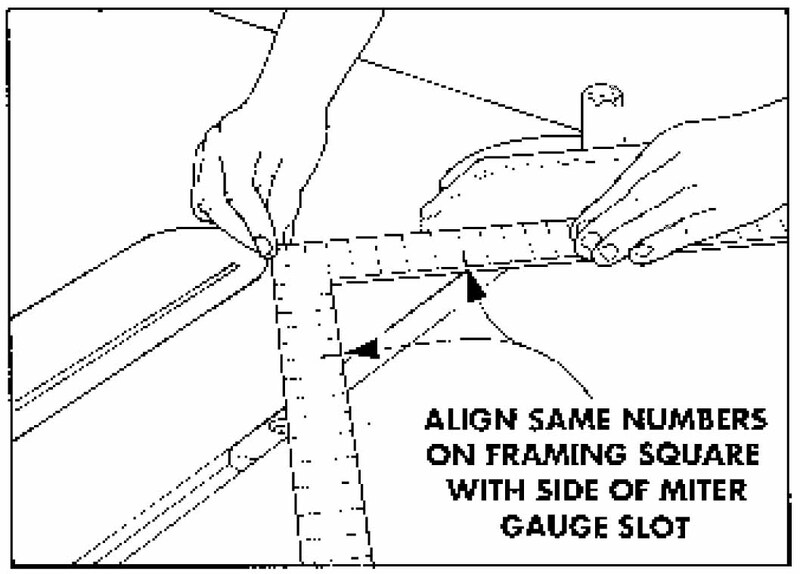 To do this, I lay the framing square on the saw table and align the 5" marks on the inside edges of the square with one side of the mitre gauge slot, see drawing. Now loosen the angle lock on the mitre gauge. 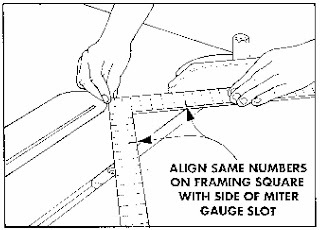 Then slide the face of the mitre gauge against the framing square and lock in the angle. This technique gives you accurate mitres if the saw blade is parallel to the mitre gauge slot (which it should be). It's also important that your framing square is truly square. Since most framing squares get dropped and banged around a lot, check your square with a try square or another framing square you're sure of. This is great post.Thank you so much about info to me.Keep your work!!! Hi …., This is great guide on how to select the best. I really loved your comparison chart and look of the site. This is a great guide on checking your miters. It will come in handy when I start up my best sliding miter saw this Saturday for my weekend woodworking projects. I always used a speed square instead of a standard framing square, like you used but I bet your square would be more accurate, especially for a 12" blade.